Toshiba Hi Wall Inverter Bright Future Split Air Conditioner Online in India. Regular cleaning and maintenance will save your money and extend the life of air conditioner. 20 minutes of fan operation after shut down dries the moist air and helps reduce mould formation. Hi-Power mode makes your room cool faster yet quietly when operating. When you come home on the hot day, just press on the “Hi-Power” button. 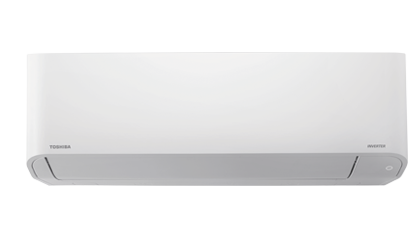 Toshiba’s extra airflow rapidly delivers extra cooling throughout the room without making undesired noise. Aqua Resin Coated coil can reduce the formation of a drop of water or oil on the coil unit also the dust is hardly stuck on coil. 5 Fan Speed with comfortable setting, Auto Fan and Hi-Power modes. You can choose from gentle airflow, right up to the full cooling of Hi-Power mode. Toshiba remote control provides a very convenient automatic stop operation, programmable for 0.5, 1.0, 1.5, ..., 9, 10, 11, 12 hours. Big air volume, quick cooling and long air flow. Achieve energy-savings of up to 25% compared CO with standard without sacrificing comfort. Condenser coil is made of copper ensuring a robust product with long life.